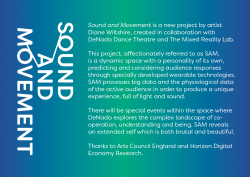 Sound and Movement (SAM) is a new project by artist Diane Wiltshire, created in collaboration with the DeNada Dance Theatre, Horizon and the Mixed Reality Lab. SAM follows on from ‘Sentiment’ and is a dynamic space with a personality of its own, predicti ng and considering audience responses through specially developed wearable technologies. SAM processes big data and the physiological data of the active audience in order to produce a unique experience, full of light and sound. Events will be held within the ‘space’, allowing DeNada Dance Theatre to explore the complex landscape of co-operation, understanding and being.